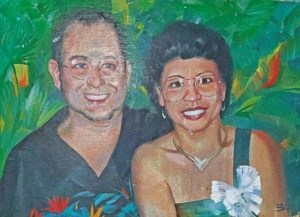 This painting of John and Teresita Noble is a testament to their young love for each other. There’s a lot of crazy reality shows on TV these days–including Married at First Sight on the Lifetime cable network. The reality show has the couple getting married without knowing each other at all and meeting each other only at the altar. Teresita was born in Mabini, Pangasinan. 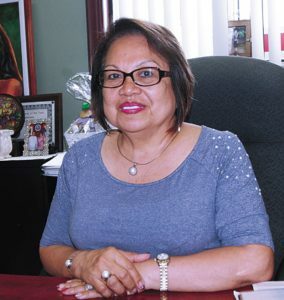 Her father Gil was the Vice Mayor and later the Chief of Police while her mother Vicenta Taoatao was a homemaker, taking care of the nine children. Teresita was the seventh child. Situated right before Happy Valley, Noble Travel has been a landmark for many years in Wailuku. Countless travelers on Maui have patronized Noble’s business because of her and her staff’s friendliness and professionalism. John stayed in the Philippines for twenty one days and over the next six months the two love birds would communicate by letters and very expensive long distance calls. A week after Teresita arrived on Maui, they were married and have been together ever since. The next year, Teresita began working at the County of Maui as a program accountant with the Department of Human Concerns, Office of Aging. In 1988, Teresita took a risk, left her secure County employment and started a business—a travel agency. Teresita started as an outside sales agent for the airlines. 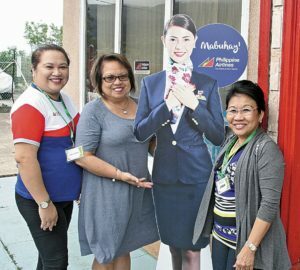 “At that time,” Teresita explained, “Philippine Airlines would issue the tickets for all agents. 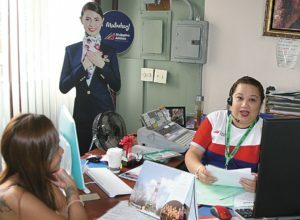 Now, you have to be an ARC—Airline Reporting Corporation—licensed agent to be a consolidator and to be able to issue tickets.” Teresita earned her ARC designation in 1990. Shiela B. Leano assists a client. Teresita really enjoyed helping others. “It’s really fun helping folks. That’s how I got to be involved in the community and my business grew. It’s very rewarding to help people. Plus I get to travel all around the world!” Teresita’s financial skills and reputation got her elected as Treasurer for the Maui Filipino Community Council, Binhi at Ani, and the Maui Filipino Chamber of Commerce. 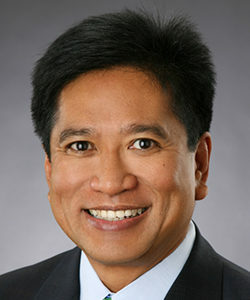 Teresita’s skills led her to be the official travel agent for the Filipino Chamber of Commerce of Hawai‘i’s Annual Trade Mission to the Philippines for over fifteen missions, with government leaders such as Governor Linda Lingle, Lt. Gov Shan Tsutsui, and various County Mayors leading the missions. When folks started making travel arrangements over the internet, many travel agencies could not compete and closed. But Teresita withstood what would be her biggest challenge to date. She estimates she only suffered a ten percent loss. “The loss due to the internet was minimal because a lot of my client base are senior citizens who need help navigating the reservation system on the internet,” Teresita explains. Joan Andia reviews a tour group’s itinerary with Noble. At her Market street office in Wailuku, Teresita oversees a well-run office with a full-time staff and two part-time staff: Sheila B. Leano, Winnie Calpito, and Joan Andia. She also has outside sales agents. 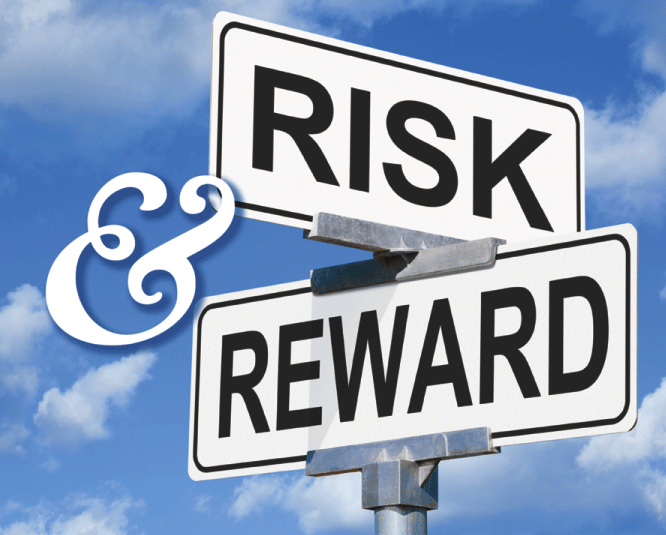 “I’ve been lucky that I have good, honest and loyal outside agents,” says Teresita. Her fifteen agents bring in about 20-percent of her gross revenues. 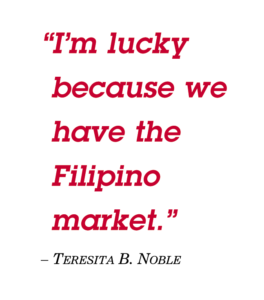 Teresita’s compensation is based on a certain percentage for each ticket sold. With Southwest joining the Hawai‘i market, Teresita says “It’s healthy because it will be competitive and people will have a choice.” If Southwest connects with Philippine Airlines and offers better rates, Philippine Airlines will contract with Southwest and many of Teresita’s passengers (95-percent are Philippine Airlines passengers) will utilize Southwest to travel to Honolulu before boarding the Manila bound flight on Philippine Airlines.